Pakistan's federal cabinet has described the US support to India as permanent member in the UN Security Council (UNSC) as a decision having "grave ramifications" and implications for peace, security and stability in Asia. The cabinet expressed concern and disappointment Wednesday over US President Barack Obama's support for India's UNSC bid, the Dawn reported on Thursday. "It has been observed that this decision (of the US) has grave ramifications for the direction and prospects of the system of multilateral cooperation as envisaged by the founding fathers of the UN Charter," said a resolution the cabinet passed at a meeting presided over by Prime Minister Yousuf Raza Gilani. 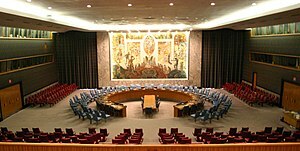 Obama made the announcement of support for New Delhi as a permanent member in the UNSC during his Nov 6-9 India visit. Obama told the Indian parliament Monday: "Indeed, the just and sustainable international order that America seeks includes a United Nations that is efficient, effective, credible and legitimate." "That is why I can say today- in the years ahead, I look forward to a reformed UN Security Council that includes India as a permanent member." The Pakistani cabinet resolution said: "It (the US decision) also has implications for peace and security and stability in Asia , particularly South Asia. It is incomprehensible that the US has sought to support India whose credentials with respect to observing the UN Charter principles and international law are at best chequered." "This is explicitly illustrated by India's disregard of Security Council Resolutions on Jammu and Kashmir and systematic violations of fundamental human rights of the Kashmiri people," it said. "The future of UN and of succeeding generations cannot and must not be premised on considerations of power politics, politics of expediency, bereft of morals and ideals, which must be the guiding spirit for an enlightened international order." Pakistan has already conveyed its disappointment to the US ambassador here over the support to India for UNSC seat. Foreign Secretary Salman Bashir told Ambassador Cameron Munter on Tuesday that the move could have serious repercussions for the conflict-ridden region and reform of the world body.